EA Sports must be sitting somewhere with smiles gracing their faces. Why? Oh, maybe due to the fact that the mega developers FIFA franchise has been the best selling sport series in history, with FIFA 10 nearing 10 million units sold since its release last year. Also, the World Cup further boosted EA Sports overall success with 2010 FIFA World Cup giving the company a massive financial boost during April-June. Their football games portfolio for 2010 will see the introduction of FIFA 11 this Fall, and while millions of fans wait in sheer anticipation, the footballer to grace the cover of the game has been revealed. Ricardo Izecson dos Santos Leite (Kaka), who currently plays for Real Madrid, will be on FIFA 11’s cover in multiple regions. 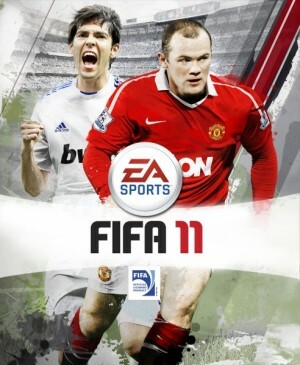 The United Kingdom version of FIFA 11, meanwhile, will see Kaka accompany Wayne Rooney who will make his fifth consecutive appearance for FIFA covers. How Kaka got onto the cover of the forthcoming FIFA game truly amazes me and surely countless others. He’s been injured for the majority of last season and faces up to a staggering 4 month wait to start the new season due to an injury. But, hey, EA Sports has shown multiple times they can improve on every FIFA installment so let’s hope exactly that applies to FIFA 11. The full cover can be viewed below. FIFA 11 will be shooting into retail this Fall. More precisely, a September 28th release date for North America and October 1st for European territories. For more news on EA Sports’ football game and exactly what the developers have improved from its predecessor, check out PlayStation LifeStyle’s previous coverage.